www.CCUUF.org | A lay led UU Fellowship. A welcoming and liberal spiritual community in Lincoln County, Oregon since 1984. Visitors Always Welcome. From September through May, we meet weekly Sunday mornings at 10:15 am, at the Visual Arts Center, 2nd Floor, Nye Beach Turnaround, 777 Northwest Beach Drive, Newport, Oregon.
. Our speaker for this presentation is CM Hall, a Central Coast Unitarian Universalist Fellowship board member and a member of the Newport City Council. CM is a lesbian-identified bisexual feminist, interpreter, and social justice activist by way of identity and passion. CM teaches LGBTQ Studies and DeafBlind Interpreting at Western Oregon University. CM is a native Oregonian and was a longtime member and friend of the UU Congregation of Salem (UUCS) where she was the YRUU (Young Religious Unitarian Universalists) youth advisor for eight years. She also became a national trainer for the UUA YRUU program for nine years and served on the UUCS Board. Monday, April 8, 3:00 pm. CCUUF Board Meeting. The Board of Trustees monthly meeting. For details, contact, Mary Ann at info@ccuuf.org. Sunday, April 14, 10:15 am. Sunday Service Presentation: Climate Disruption and You. Facilitator: Bill Kucha. This follow-up presentation from the February 24th talk entitled “Where in the World Do You Fit Into Climate Change?” will be conducted as a discussion of the situation we face, and a sharing of what personal steps we, as individuals, are taking or will take to address Climate Disruption. It is incumbent upon us to create strategies to build resilience into our communities and to learn to adapt to the harsher times surely to come and in some cases already here, as well as to figure out what we can do now to mitigate and limit future damage to our environment. Come bring your open and creative minds and hearts as we begin to weave back together our broken and ailing Earth. Sunday, April 14, 10:15 am. The Monthly Book Exchange. Bring a book you have finished and find it a good home with someone else in the fellowship. And maybe someone will bring one that you will want to take and read. Sunday, April 21, 1015 am. Sunday Service Presentation: The Thread of Memory. Presentation by the Rev. Millie Rochester. Memory has been called the most wonderful ability. While it can be retentive, serviceable, and obedient, it can also sometimes be weak and bewildered; a powerful, ongoing narrative we use to understand and manage our lives. This morning, we reflect on the power of memory both to connect us with the past and to shape who we are in the present. Millie Rochester grew up in Maine and Northern California. She and her life partner, Roger, met while they were in college, and this spring will celebrate their 48th wedding anniversary. Millie received her Masters of Divinity from Meadville Lombard Theological School in 2003, and served congregations in Chicago, Florida, and Winnipeg, Manitoba before retiring from settled ministry four years ago and re-settling in the Pacific Northwest. She and Roger are delighted to be closer to their four children and three grandchildren. Favorite pastimes include reading (mysteries and historical fiction, especially), exploring new places (libraries and churches, especially), and being with family. Sunday, April 28, 9:30 am. Fellowship Annual Meeting of Members and Potluck Brunch. ***Held Offsite*** Our annual meeting of member will be held at the Yaquina Bay Yacht Club, 750 SE Bay Blvd, Newport, OR 97365. Come join us for food, the annual State of the Fellowship Address, election of officers and board members, discussion of the goals of the fellowship, review of the finances of the fellowship, and approval of the budget for the upcoming fiscal year. Monday, April 29, 5:30 p.m. Stone Soup Dinner. We rotate with other congregations in Newport in preparing a community meal on Monday evenings at St. Stephen’s Church. April 29 is our next assigned night to host the dinner. We need volunteers to shop and prepare the meal earlier in the afternoon, to serve the meal, and to clean up afterwards. Sunday, May 5, 10:15 am. Sunday Service Presentation: Q&A–Everything You Wanted to Know About UU. Presentation by the Rev. Rick Davis.
. This presentation by Rev. Davis will be in a question and answer format rather. It’s a tradition in the Salem UU Congregation that once a year Rev. Rick Davis fields written questions submitted during worship. So what question is arising in your mind that you’d like him to address?
. The official symbol of Unitarian Universalism is the flaming chalice. Rev. Davis suggests that the unofficial symbol is “?” — the question mark — because UU’s encourage the asking of questions, recognizing that such questions open portals through which we pass to deeper truth and understanding. So, come on this Sunday with a question to submit. He will do his best to respond to as many as possible during this service.
. He received his Master of Divinity from Emory University, Chandler School of Theology in 1986, and was ordained in 1987 at Emerson Unitarian Church in Canoga Park, CA where he served for six years. His duties at UUCS include worship, pastoral care, community connections, outreach, administration and teaching. Monday, May 6, 3:00 pm. CCUUF Board Meeting. The Board of Trustees monthly meeting. For details, contact, Mary Ann at info@ccuuf.org. Sunday, May 12, 10:15 am. Sunday Service Presentation: A UU Eighth Principle? Presentation by CM Hall.
. CM will facilitate a discussion about this proposed principle and is the significance of it for us. Sunday, May 12, 10:15 am. The Monthly Book Exchange. Bring a book you have finished and find it a good home with someone else in the fellowship. And maybe someone will bring one that you will want to take and read. Sunday, May 19, 10:15 am. Sunday Service Presentation: Strong Back, Soft Front. Presentation by Annette Leonard.
. Times of pain and difficulty are most often also our times of greatest growth and change. It would be nice if we maximized our learning during times of ease and comfort but that just isn’t how we’re wired. Understanding these times as invitations to deepen our connection with our self and our community we can cultivate strength and vulnerability; resilience while remaining supple — a strong back and a soft front. We can also develop greater skill in not believing everything we think which helps alleviate some of our suffering. Drawing from wisdom traditions, pop psychology, and her own deep knowing, Annette has cultivated her own resilience through a series of health crises. She works to cultivate wholeness by doing things that bring her joy.
. Annette has a degree in ASL Interpreting from Western Oregon University and Masters Degree in Conflict Resolution. She has spent much of her career in higher ed, working went on several grant-funded projects, serving as the Director of Services for Students with Disabilities and as the Assistant Direct of Conflict Resolution Services at the University of Oregon. Eventually, she worked for Lane County government as their Supervisor of Equity and Training programs.
. Annette is an artist working in a variety of mediums from watercolor to embroidery. She enjoys playing with her two dogs, knitting, reading, and is currently a bit obsessed with the recording artist P!nk and the truth-teller Luvvie Ajayi. Living in Eugene with her wife, Annette spends time on her back yard swing, perfecting her nachos, and day dreams about taking a hip hop dance class. Sunday, May 26, 10:15 am. Sunday Service Presentation: Religious, But Not Necessarily–The Final Chapter. Presentation by Brent Burford. We will complete our series on the nexus where religion, psychology, and philosophy intersect. Psychologist Erich Fromm, Carl Jung and others write about ultimate truths of our relationships with each other and the world. On one level these sound religious–speaking of morality, ethics, compassion, kindness, mercy–but are written for a larger audience that transcends religion. We’ll see what we think of their efforts to make these (not quite) religious writings a call to action for a secular world.
. Brent is a recurring speaker at the Central Coast Unitarian Universalist Fellowship over the last eight years. He was the Program Chair for Central Coast UU Fellowship for three years and was on the Board of Trustees for two years for the fellowship. –We are a Welcoming Congregation. All are equally welcome regardless of race, background, gender, or sexual orientation. Monthly meeting of the fellowship’s Board of Trustees is usually on the first Monday of the month at 3:00 pm. Usually held at the Newport Public Library conference room. Contact Mary Ann at info@ccuuf.org for confirmation of location and of time. The monthly UU ladies lunch, starting with the July 2018 lunch, is moving to the 2nd Thursday of the month in Newport at 11:45 am. For location and confirmation of time, contact Connie at admin@ccuuf.org. RSVP requested if you are going to attend. The Newport monthly UU breakfast is usually on the third Friday of the month in Newport at 9:30 am. For location and confirmation of time, contact ccuuf.org@gmail.com. Oregon UU Voices for Justice. Contact or join Oregon UU voices on social issues at: http://www.uuvoicesoregon.org/. 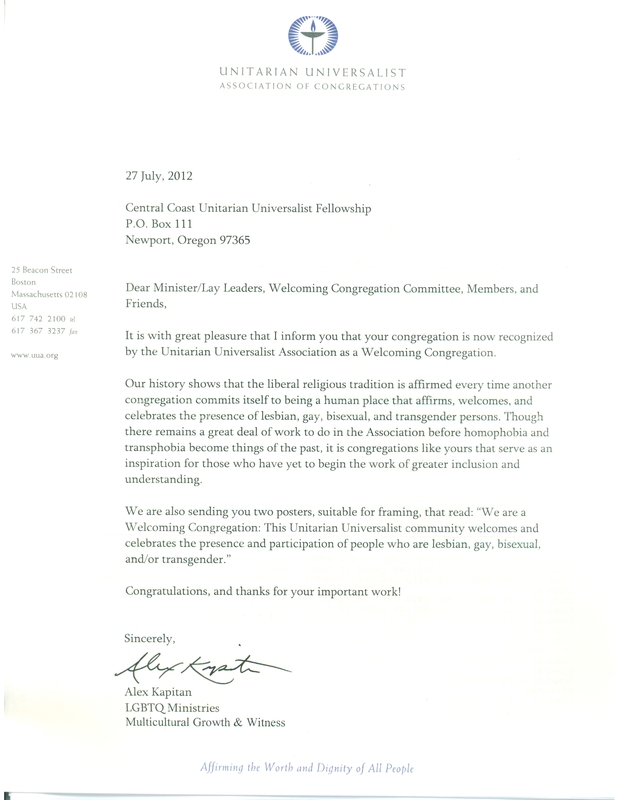 CCUUF recognized by the UUA as a “Welcoming Congregation.” Since 2012 Central Coast Unitarian Universalist Fellowship has been recognized by the Unitarian Universalist Association of Congregations (UUA) as a Welcoming Congregation.